More than 36 million Americans practice yoga, according to an Ipsos Public Affairs poll, making it one of the country’s most popular forms of physical exercise. And its popularity is on the rise among America’s seniors, partly because doctors are increasingly recommending it, along with meditation, because of its ability to control blood pressure and alleviate joint and muscle pain, among many other health benefits. 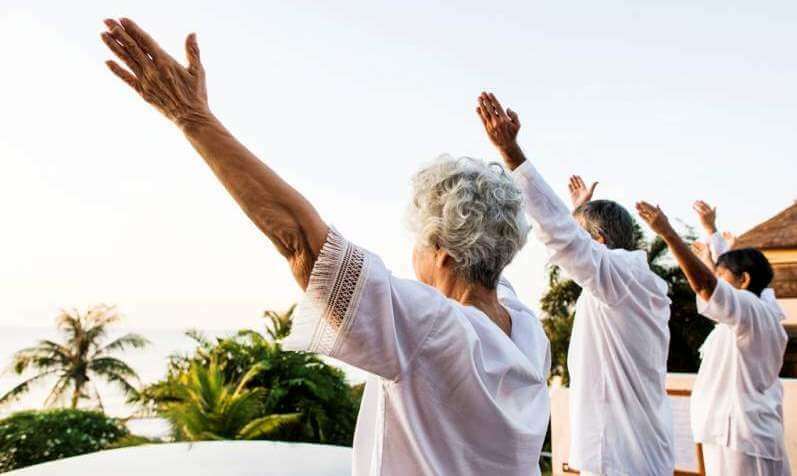 Yoga is also the most comfortable way for many seniors to get the activity they need to stay physically and mentally fit and remain socially engaged. Plus, it’s an ideal recreation for seniors and their caregivers to do together. The senior-caregiver relationship creates a strong emotional bond, but there is also a fair amount of stress and anxiety involved in this relationship, particularly for a caregiver who has little time to engage in proper self-care. That’s the case for many people caring for a senior relative who requires round-the-clock attention. Yoga helps create an even stronger caregiver-care subject bond because they can do a mutually beneficial activity together. Yoga, for example, relieves the caregiver’s stress and improves the care subject’s physical and mental condition, which is good for everyone concerned. Studies have also shown that yoga’s fluid, gradual movements and poses can help people suffering from Parkinson’s disease, cancer, arthritis, heart trouble, chronic pain, and more. It’s also effective at reducing anxiety and depression, and can even slow the spread of dementia and Alzheimer’s disease. Meditation offers seniors and caregivers a calming, rejuvenating activity they can do together in a quiet space. It’s a mental discipline that fosters a mindset of relaxation through various techniques. Concentration meditation, for instance, involves focusing your thoughts on a single point, such as your breathing, a word or phrase. Mindfulness meditation encourages you to let your thoughts wander, not judging but being aware of each thought as it occurs. The best thing about practicing meditation is that it doesn’t require any special equipment to get started. However, some people often find it difficult to “steady the mind” and control the constant flow of thoughts, especially when they’re stressed. As such, it’s beneficial to seek out online tutorials or free smartphone apps that can guide you through the process when you’re first starting out. The experts at Healthline have assembled a list of free, premium, and “freemium” apps that can help you find your footing during those early stages. As yoga “partners,” caregivers and their charges can provide mutual support. Some older Americans have conditions (i.e. prosthetic devices, artificial joints, etc.) and require special assistance when it comes to movement. 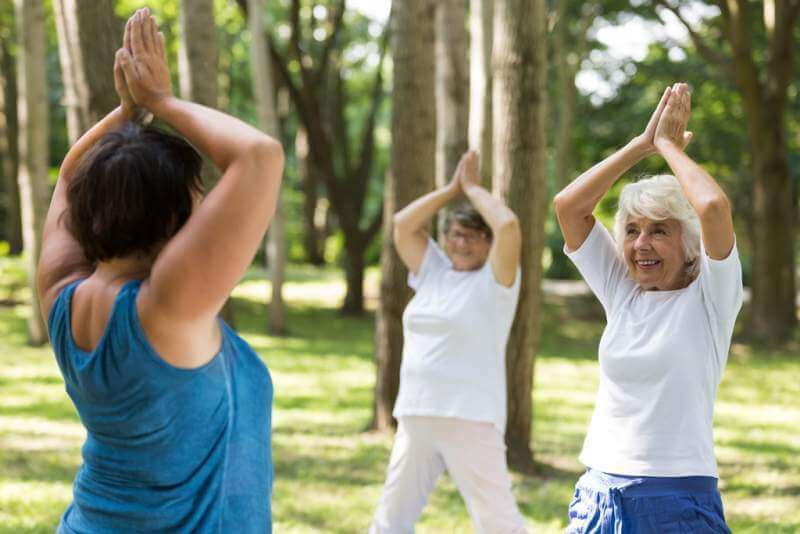 Having a caregiver nearby can make learning yoga considerably easier for an older individual, and the support of a loving relative is beneficial to the caregiver’s efforts to learn a new (and possibly intimidating) process. 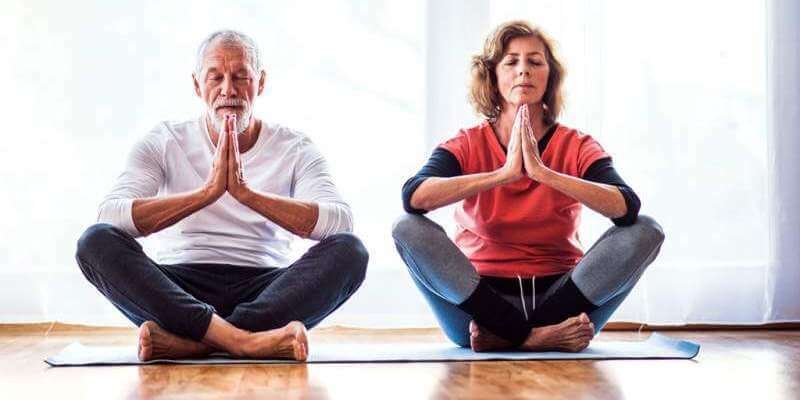 Working together, you can find a class and intensity level that’s right for both of you, which is an important point because some forms of yoga are quite athletic and intense and not appropriate for many older adults. Try to find some cheap classes in your area at a community center. Also, while basic Medicare doesn’t cover the cost of a yoga class, there are some Medicare Advantage plans that cover this cost. 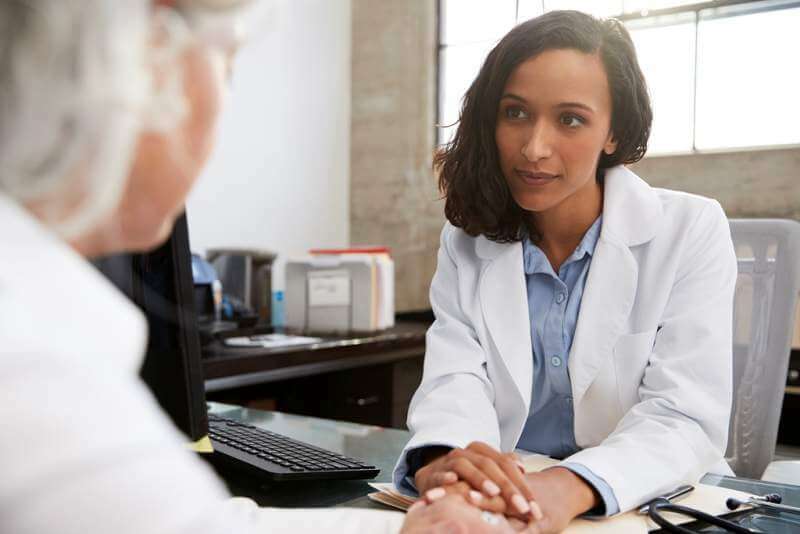 Consult some online resources to learn more about what Medicare Advantage covers. 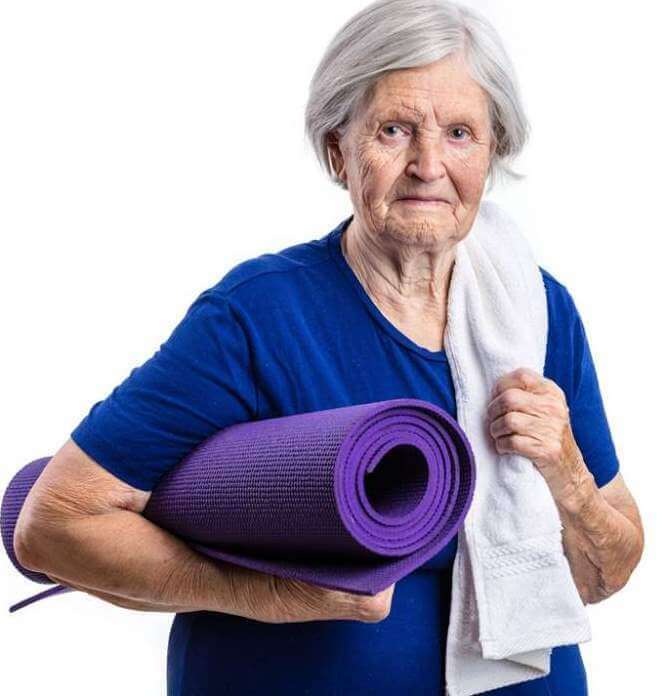 A senior who’s just getting involved in yoga may be understandably nervous about trying a form of exercise that may look like a painful and demanding physical discipline. Someone new to it might be concerned about being paired with people who have more experience performing poses that look difficult, even uncomfortable. If your older relative has a dog, there are opportunities to bring the pup along and engage in a form of yoga known as “Doga,” which is an increasingly popular activity that helps dog owners become comfortable with the practice of yoga alongside their furry friends. Look for a Doga class near you. If you’re a caregiver, you can reassure your relative that yoga is not a high-impact workout that could end up doing them much more harm than good. It’s an ancient practice that’s about achieving balance between mind and body. Rest assured, however, that no yoga pose should ever cause any pain or discomfort — class instructors are there to help you both get the most out of the experience and avoid any kind of tenderness. Remember, a yoga pose should be calming and relaxing and not a gymnastics or wrestling maneuver that twists your body into a position that makes your limbs and muscles feel uncomfortable. Your instructor can help structure the experience so that you both benefit and learn at your own pace. Before you begin your first yoga class, it’s extremely important to talk to your doctor about beginning any new form of exercise or physical excursion. He or she can point out certain things to watch for and let you know if there are any movements that should be avoided or which should be approached with special care. Remember to keep this in mind when searching for a yoga instructor as well; if the individual doesn’t have experience working with someone who has limited mobility or requires less strenuous poses, then you should find a different class. 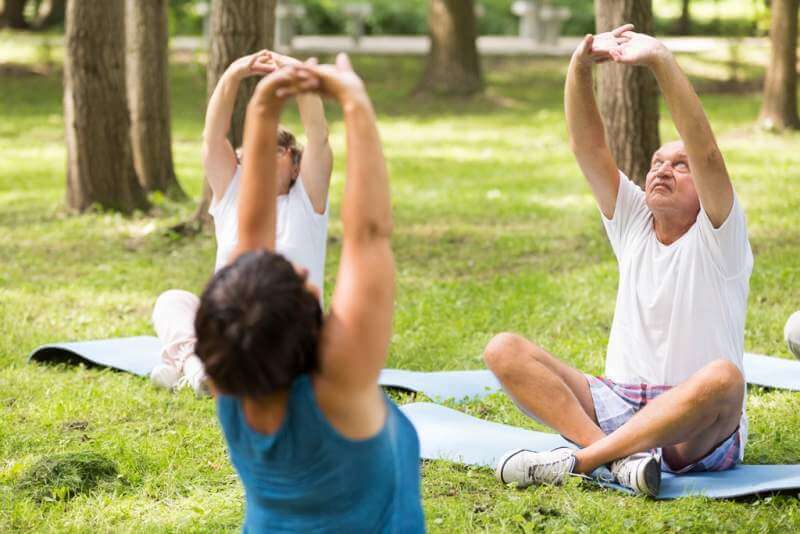 Yoga is, in many ways, an ideal form of physical activity for older adults and a great way for caregivers and their care subjects to bond and stay active together. What’s more, meditation can also give them a mutually beneficial activity that will help alleviate stress and anxiety for both parties. These are important points for seniors who need to find some way to remain active, as well as for caregivers, who need an escape from the strains and stresses of watching over a loved one. Don’t let yoga intimidate you and prevent you from reaping the benefits.